I have a deep affection for Secret of Mana. That game, which we'll talk about in a different article, is a fun blend of Zelda-like game play and traditional JRPG mechanics (like leveling and spells). All mixed together the game is fun and engaging, a delightful little romp. However, while I dig Mana, for the longest time I'd never bothered to play its predecessor: Final Fantasy Adventure. Honestly, if you were a kid in the 1990s you might not have realized the two games were even related due to their differing titles -- in Japan, though, these two games (and a number of sequels and spin-offs) were all part of the Seiken Densetsu series. Of course, there's also the possibility that you thought Adventure was actually a spin-off of the Final Fantasy Legend series, which it wasn't -- Legend was actually part of the SaGa series, unrelated to Final Fantasy in any way. Sometimes Japan just makes things so confusing. Regardless, we're talking about the first game in the Mana series (as it's known here in the U.S.), Final Fantasy Adventure. 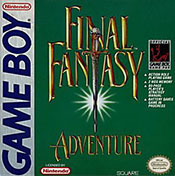 Released in 1991 for the Nintendo Game Boy, Adventure played like a weird mix of Zelda and Final Fantasy. The world is one large, interconnected series of screens that the player explores, a la Zelda -- there's no overworld the character switches to as everything happens in the main, large map. As you explore you'll find monsters to kill, earning gold and experience (a la Final Fantasy). You'll end up searching dungeons, finding weapons you'll need to fight the enemies as well as explore new sections of the map (like an axe to fell trees). You'll also gain magic spells to aid you in your quest. While all the elements are great in theory, the problem with Adventure is its, at times, brutal difficulty. The game is straight up hard with strong monsters and punishing status effects. This is coupled with some wonky combat with hit-boxes that aren't quite right and a number of weapons that force you to get up close to hit enemies. It's a recipe for death on a regular basis. Worse, though, are the confusing dungeon layouts with no map to help you navigate. Finding your way through the game requires patience, a good memory, and a lot of hard work. The puzzles and traps required to gain entrance, or get through, the dungeons can be downright confusing, leading to a number of instances where you just have no clue where to go or what to do (just ask any experience gamer about the palm trees puzzle). Still, while a number of elements are brutal, the game does have its delights. The overworld music, for instance, is one of the best tracks ever released for the Game Boy. The graphics, too, are charming, with large, detailed enemies and a number of nicely drawn backdrops. And, of course, if you're able to find a town and are willing to put in the time to just grind out the game, you can essentially cheese your way past some of the difficult parts. Nothing beats having a hero character 20 levels higher than the enemies you're supposed to be fighting.